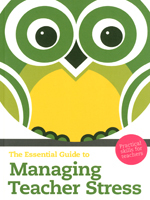 Bill Rogers, world-renowned expert in classroom management and teacher stress, focuses on peer-support to show you how to reduce stress levels, achieve a work-life balance and be a successful classroom teacher in The Essential Guide to Managing Teacher Stress. This is your definitive guide to coping with the stresses of the teaching profession and is designed to confront stress-causing factors in positive, supportive and practical ways. Whether it’s the behaviour of a challenging class, the volume of paperwork or difficult relationships with colleagues causing you stress, Bill Rogers has the advice you need to make a difference.